Sloshing through the streets in our rain soaked clothes wasn’t that much fun, so instead we holed up in our cozy room for a Netflix marathon. Luckily for us the weather improved the next day and Vancouver had a chance to redeem itself. And redeem itself it did! 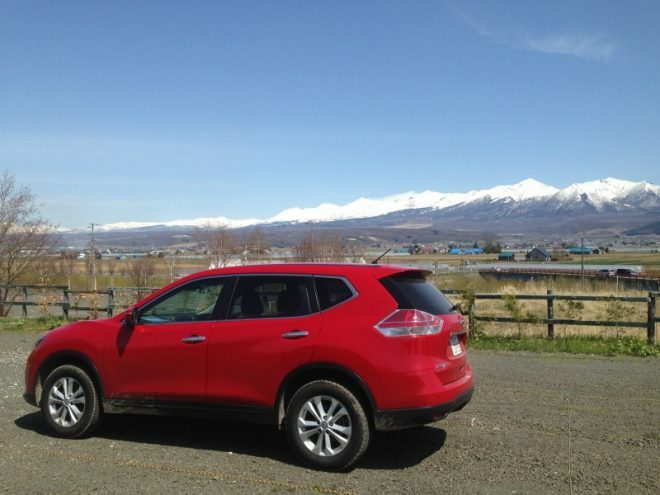 How to get around in Vancouver? 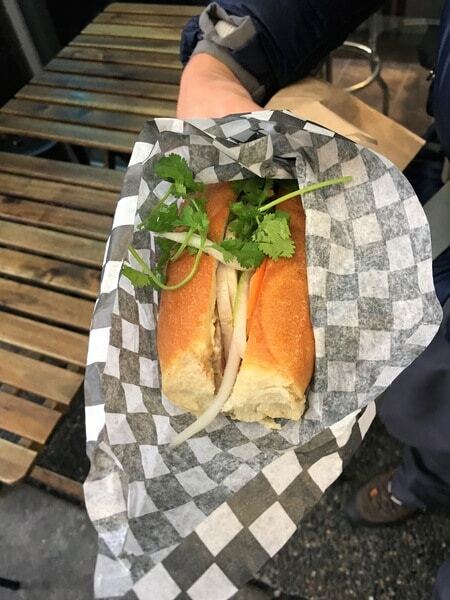 I’ve market all the highlights we visited during our time in Vancouver on the map below. I also added my favorite places to eat and where we stayed. At the end of the post you can download this map as a (printable) pdf. 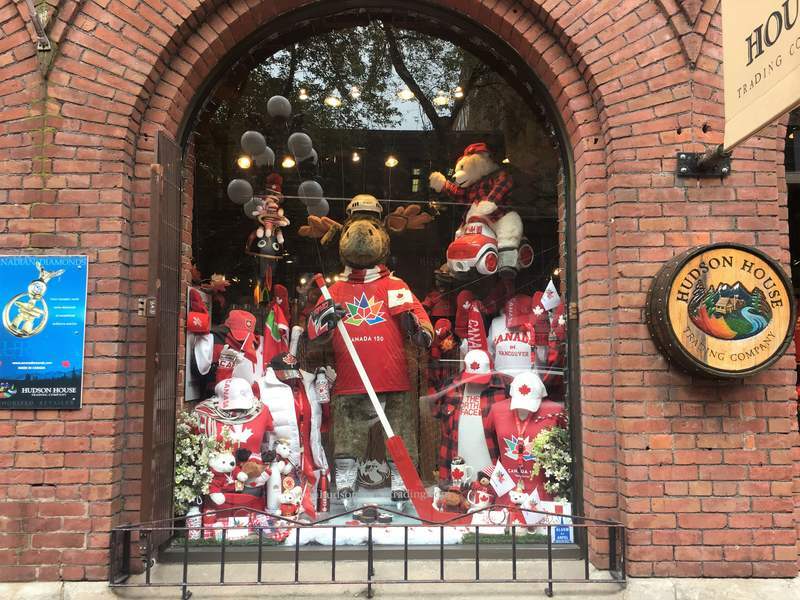 Things to do in Vancouver on day 1: coffee at Tim Hortons, breakfast at Purebread, explore Gastown (incl. the Vancouver steam clock), walk to Canada Place, take the Aquabus to Granville Island public market for lunch, visit the Vancouver Art Gallery, have dinner at Ramen Gojiro. 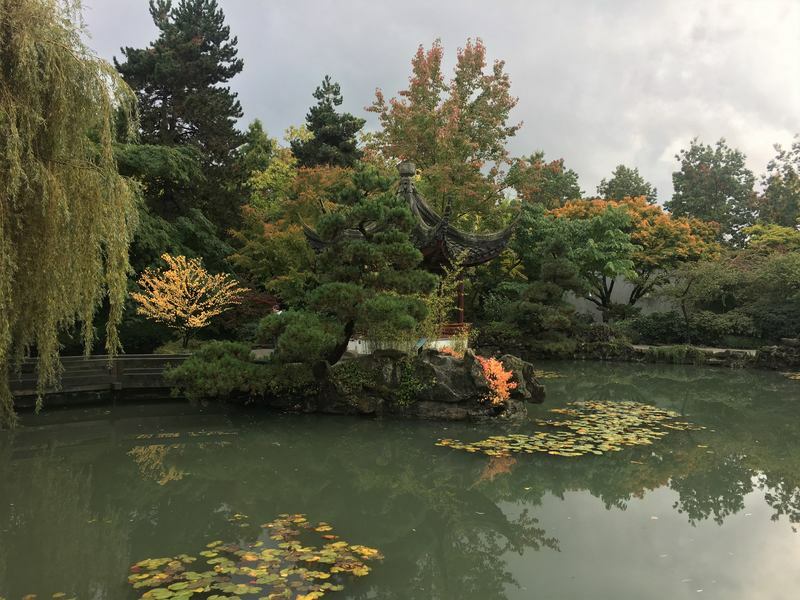 Things do do in Vancouver on day 2: walk around Stanley Park (Totem poles, Lions Gate bridge, Siwash rock, Lost Lagoon), check out the A-maze-ing Laughter statues and the Inukshuk, grab lunch at Pholicious, explore Chinatown and the Dr. Sun Yat Sen Park, have dinner at St Regis Bar and Grill and watch the sunset at Kitsilano Beach Park. There is nothing more Canadian than Tim Hortons! Don’t believe me? Just watch this clip (and this one) from How I Met Your Mother. 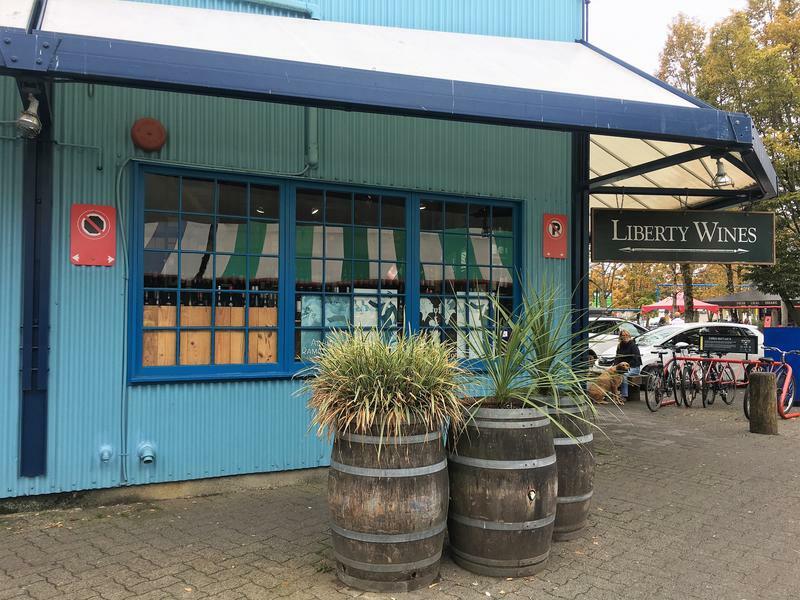 Their coffee is delicious and the perfect way to begin your day of sightseeing around Vancouver. Now that you’ve finished your coffee you may want some breakfast too. 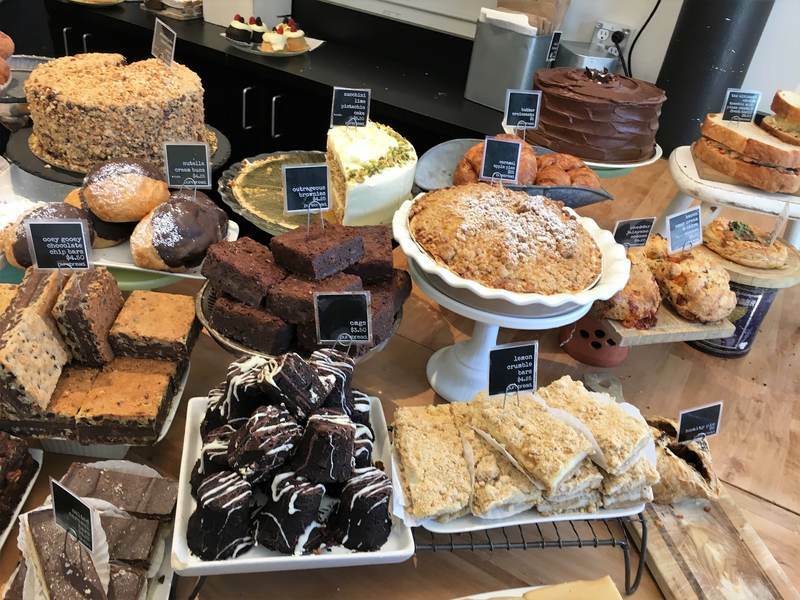 I cannot recommend Purebread enough, it’s a cute little bakery on West Hastings Street and everything they sell is delicious… It doesn’t really matter what time of the day you go here, just go, you won’t regret it! Great, now that you’ve got a full tummy and the necessary caffeine it’s time to get going! 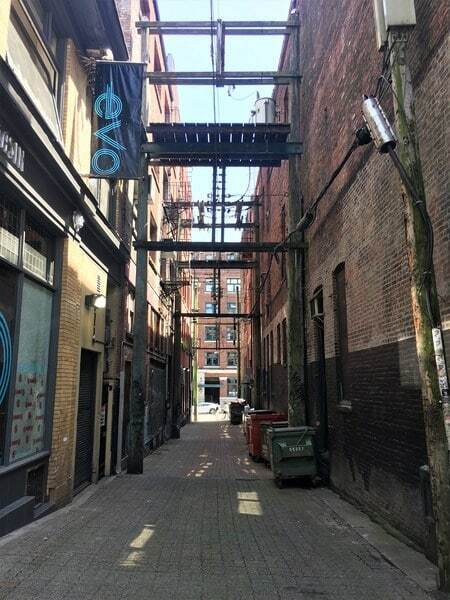 One of the oldest neighborhoods in Vancouver is Gastown. 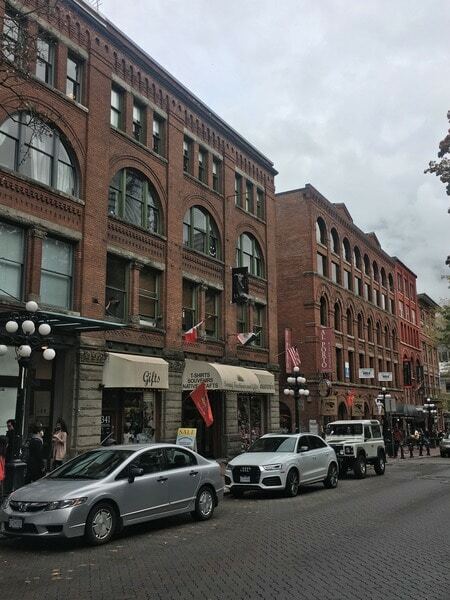 In Gastown you’ll find beautiful old houses, boutique shops, art galleries and plenty of places to grab a bite if you are still hungry. Water Street is Gastowns most famous street, but the neighborhood covers the entire area between Richards East and Main Street. 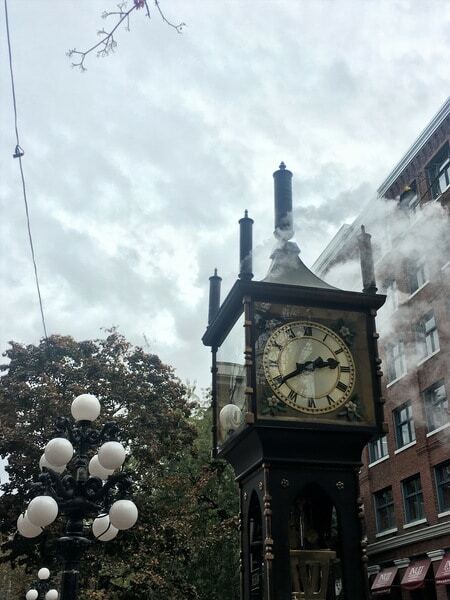 Be sure to check out the Gastown steam clock! Despite this highly visible and cool clock it’s easy to loose track of time in this charming neighborhood! Read more about Gastown here. 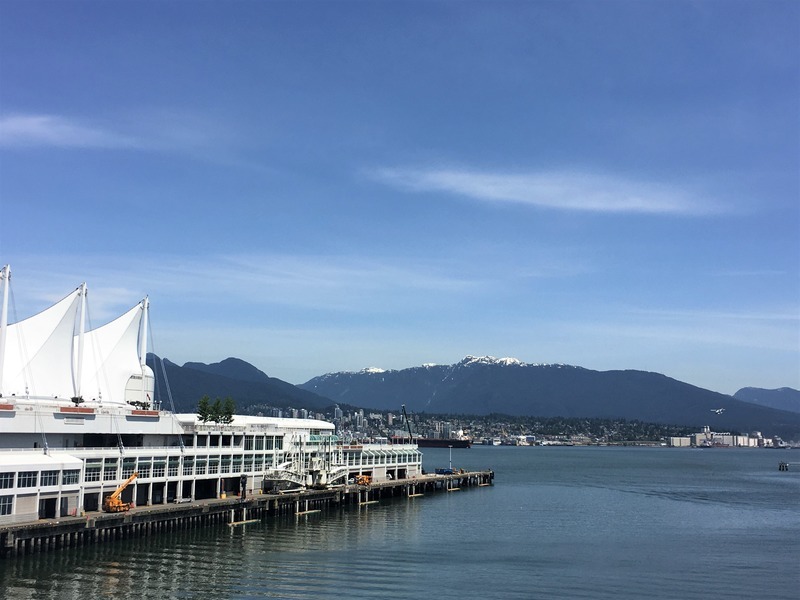 Yup, Vancouver has it all: beautiful mountains (it’s only a 90 minute drive to the snow-covered slopes of Whistler) and an equally beautiful ocean (there are several beaches in the city). From Canada Place you can see both and ask yourself why you are not living here. 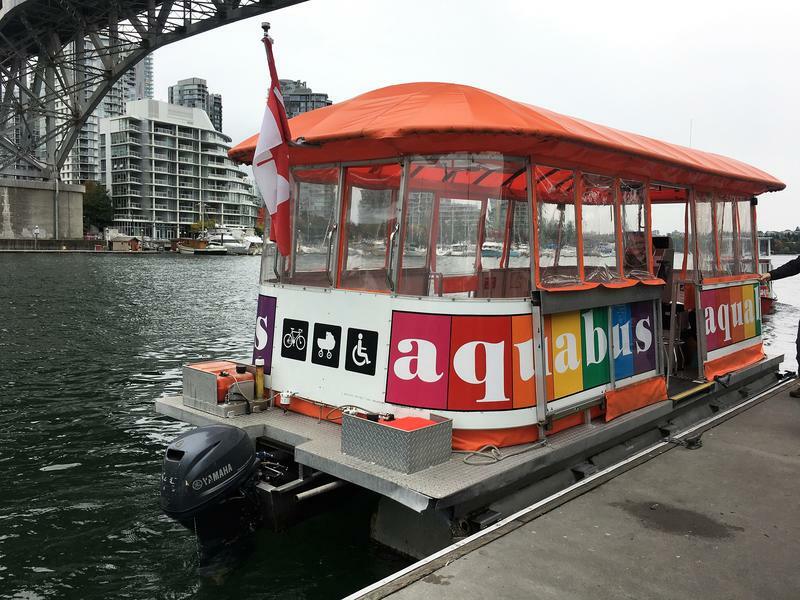 The Aquabus is an important part of Vancouver’s public transport system and a fun way to get aroun! You can find more information (map with docks, fares, etc.) at the Aquabus website. The Aquabus fee from Hornby Street to Granville Island costs 3,50CAD per person. 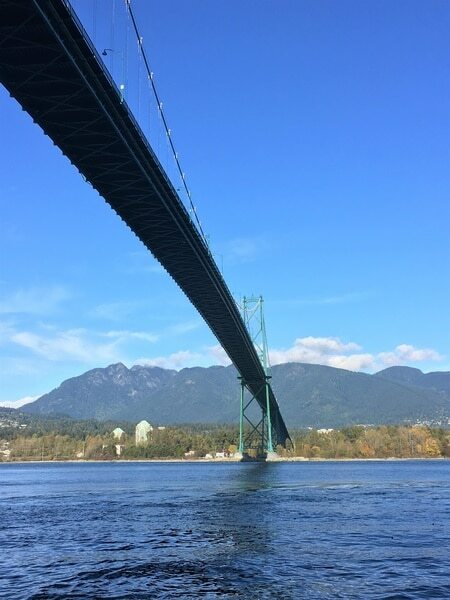 Instead of taking the Aquabus you can also walk across the Granville bridge for a beautiful view over the city. 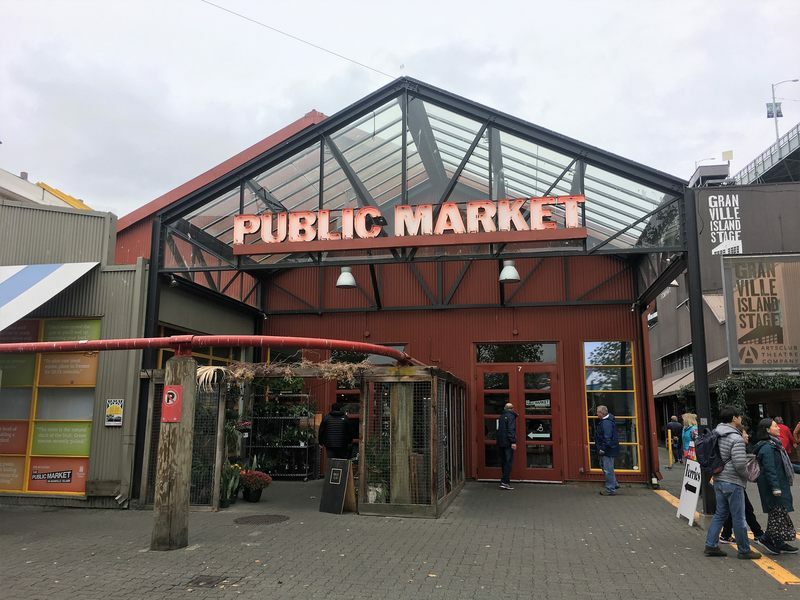 There are soooooooooooo many delicious things to eat at the famous Granville Island Public Market… Because it’s an indoor market this is also a great activity for a rainy Vancouver day! 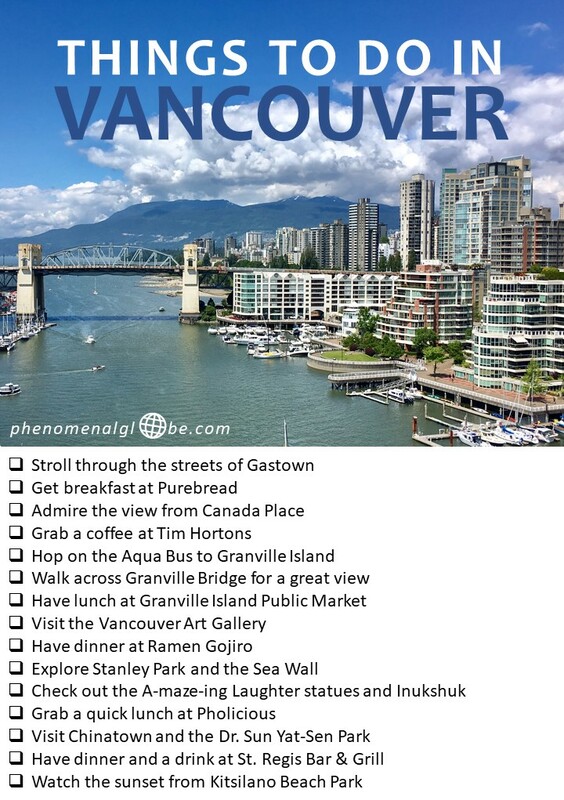 On the Granville Island website you can find itineraries with suggested activities. 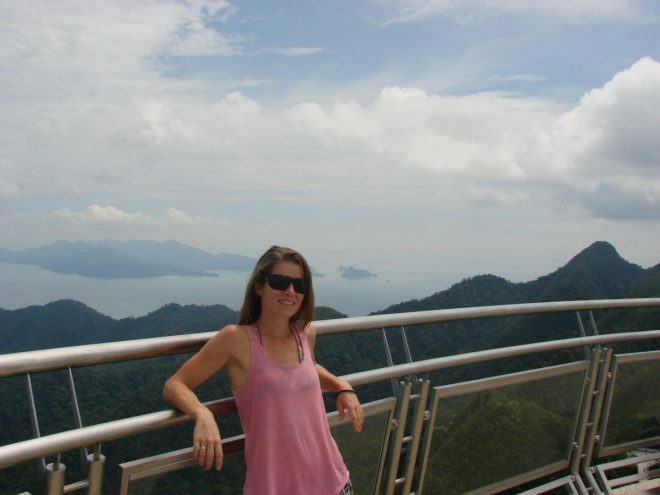 You can choose from several itineraries, depending on how much time you plan to spend on the island. 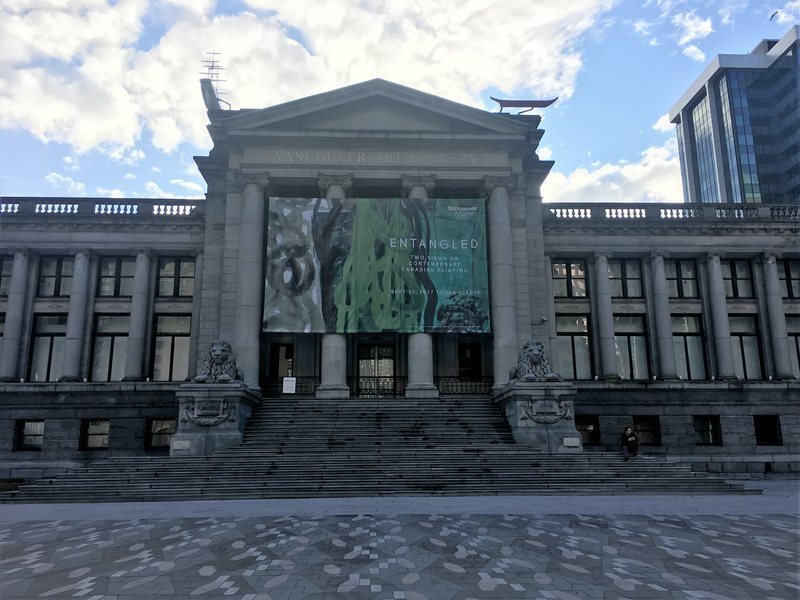 If you are into art you must visit the Vancouver Art Gallery! The gallery was founded in 1931 and is one of North America’s leading visual arts institutions. The ticket price is 18CAD per person. If you have enough time (and energy), I highly recommend to do the 9 kilometer walk around Stanley Park over the Sea Wall. 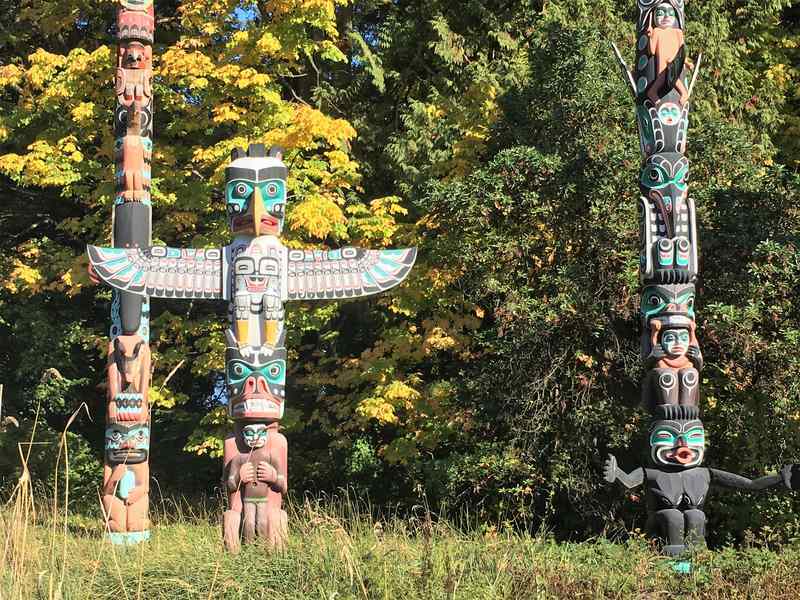 Along the way there are many interesting stops, like the famous totem poles and Siwash Rock. Stanley Park is a National Historic Site and beloved by all Vancouverites. 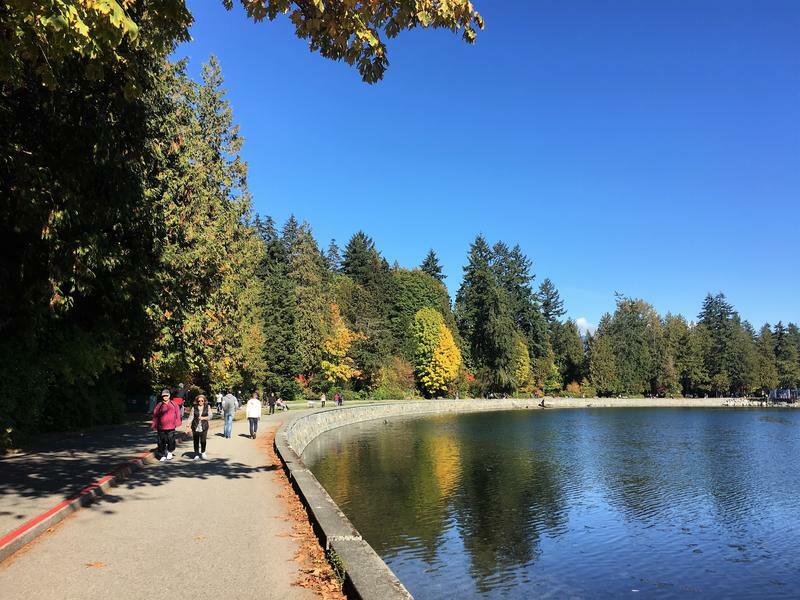 Fun fact: Tripadvisor named Stanley Park ‘the top park in the entire world’. 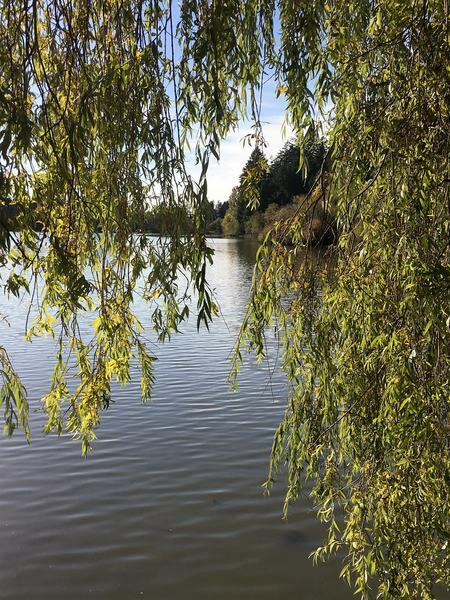 Bottom line: if you are in Vancouver, you must visit Stanley Park! On this website you can find a map of the Seawalk and sights to see along the way. 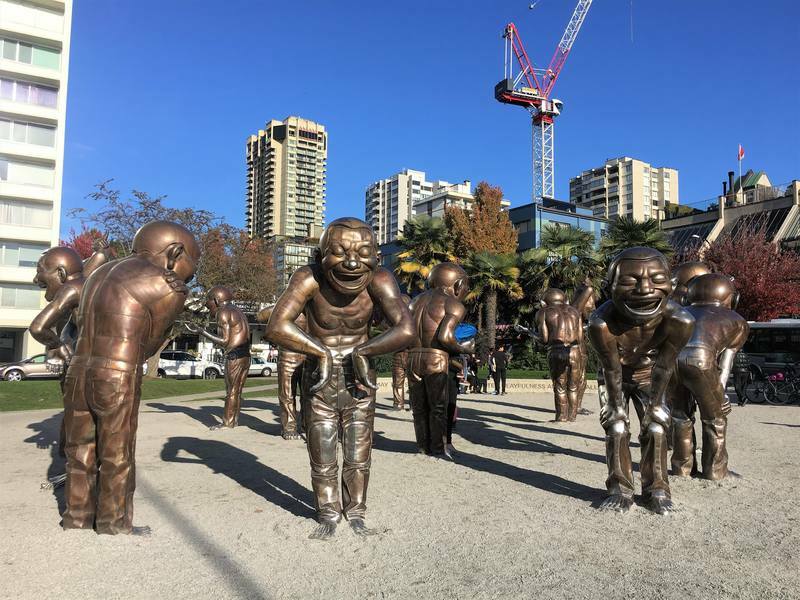 The A-maze-ing Laughter put a smile on anyone’s face, which happens to be the exact intention of the artist Yue Minjun. He wanted to touch the heart of each visitor and it’s a-maze-ing to see how he more than succeeded in doing so. Just spend 15 minutes watching people visiting the statues, you’ll see what I mean. 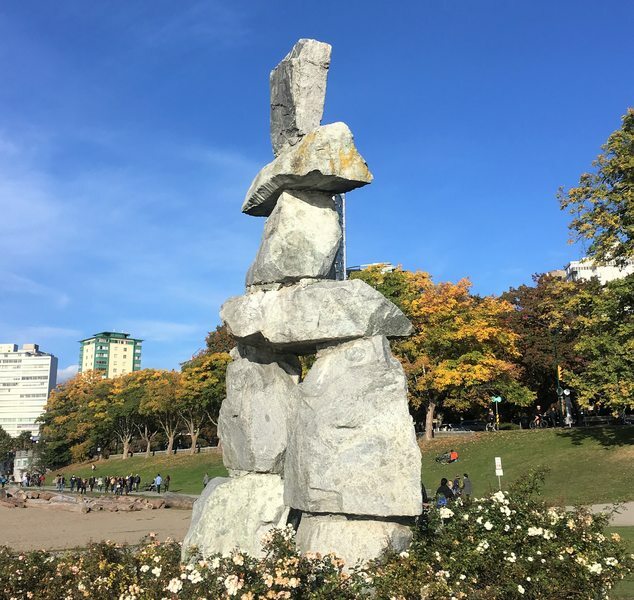 Another beautiful sculpture is the Inukshuk on English Bay, which became famous as the symbol of the Vancouver Winter Olympics in 2010. More Inukshuk are found in the (far) north of Canada, they are part of the culture of the Inuit and other Arctic peoples. It’s probably because I’ve spend a lot of time in Southeast Asia, but I love the food from that region. 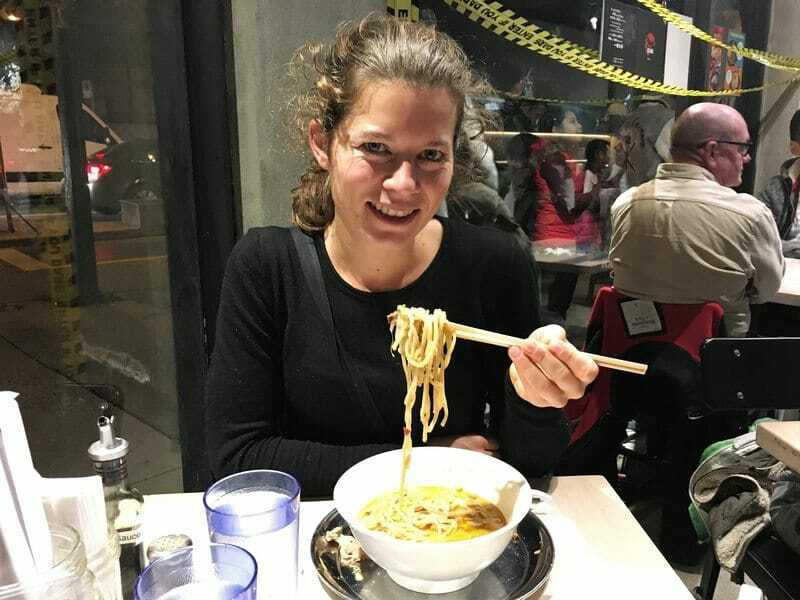 Vietnamese may be my favorite cuisine, but it’s really difficult to choose;-). 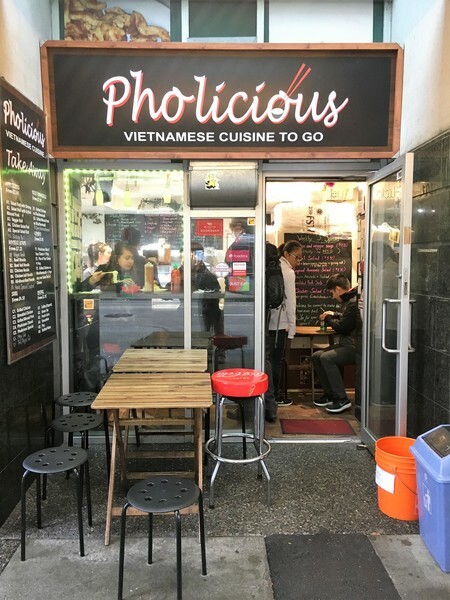 Regardless, the Bánh mì sandwich from Pholicious was… delicious! And very cheap too (only 4,50 CAD). 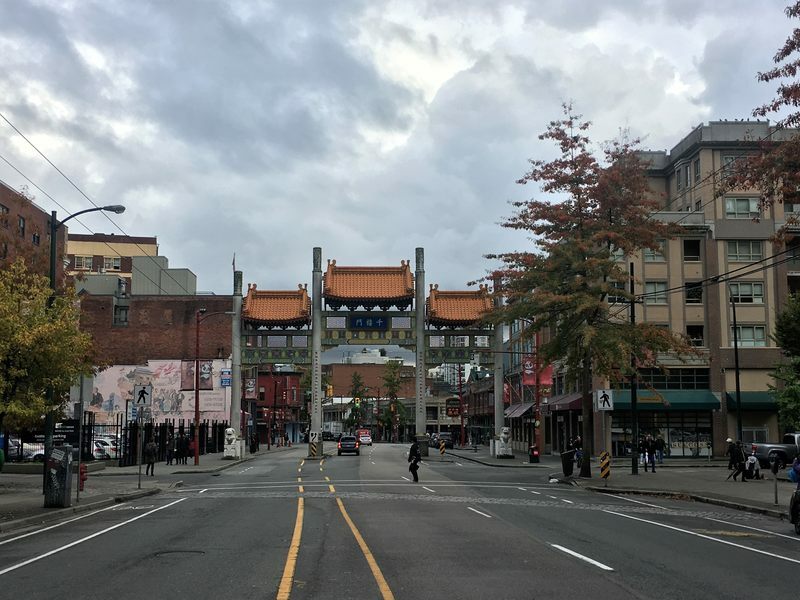 Vancouver’s Chinatown is the third-biggest Chinatown in North America, only New York and San Francisco are bigger! 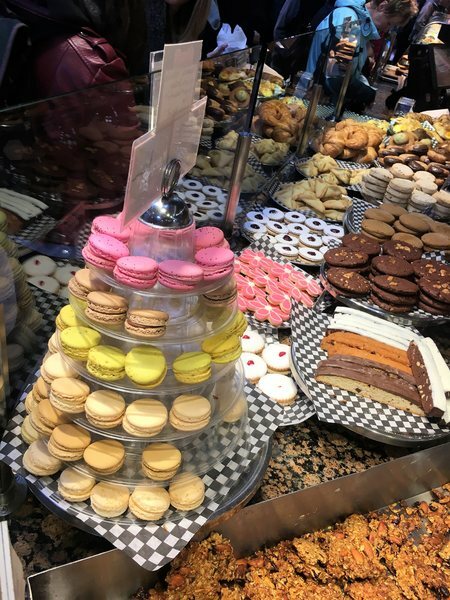 There are lots of Chinese shops and places to grab a quick snack (like Chinese pastries). 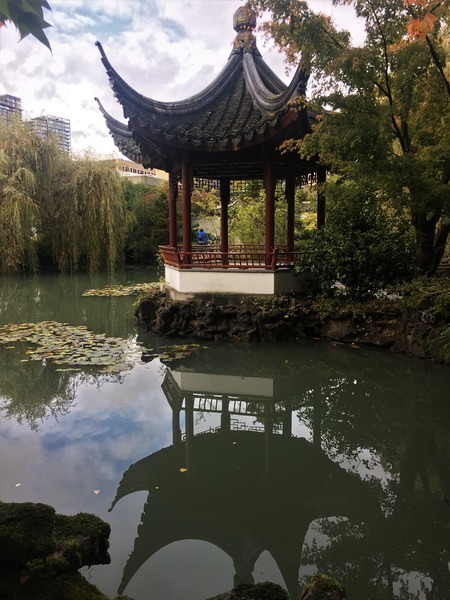 Within Chinatown you’ll also find the famous Dr. Sun Yat-Sen Park, a classic Chinese Garden with a lovely pond and pretty pagoda. 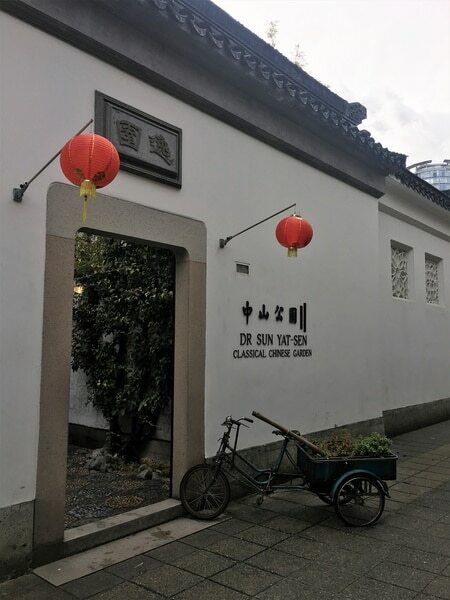 Read more about Chinatown here and about the Dr. Sun Yat-Sen Chinese Garden here. 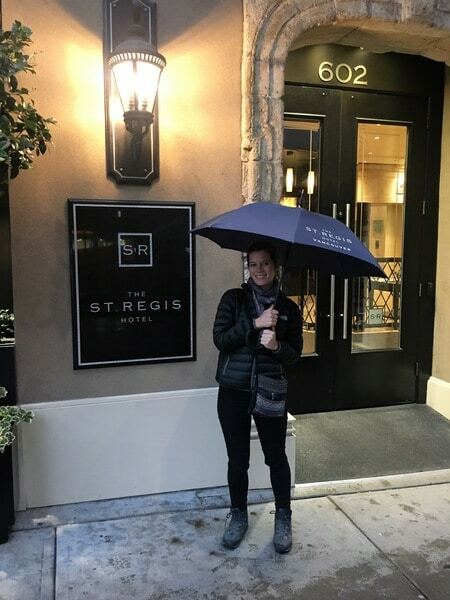 Adjacent to St. Regis Hotel is the St. Regis Bar and Grill, the perfect place to relax with a glass of wine or beer after walking around all day! I loved the atmosphere, many people were very into the Canadian sports shown on the TV screens and it was fun to watch them cheer for (or shout at) their favorite team. 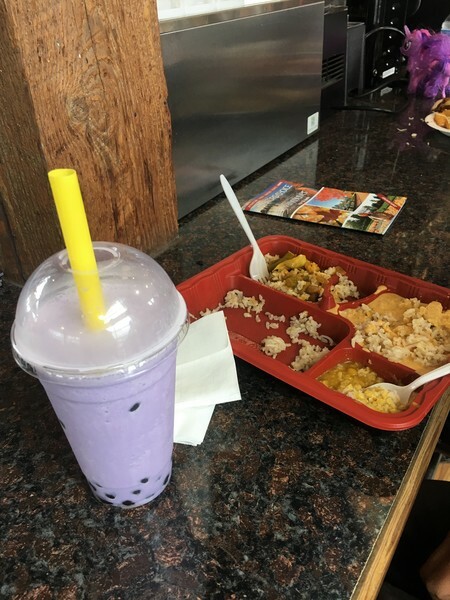 Besides the friendly vibe, the food is great too! 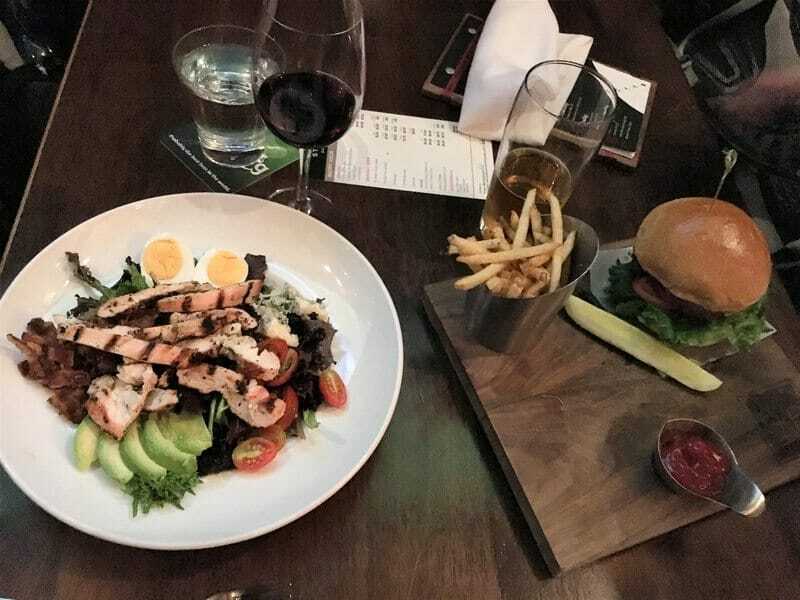 I had the Cobb Salad and Frank the Mushroom Swiss burger, the portions are quite big and I was too full for desert (though I would have loved to try the cheesecake or warm cookie skillet with an overdose of chocolate). Check out their menu here. 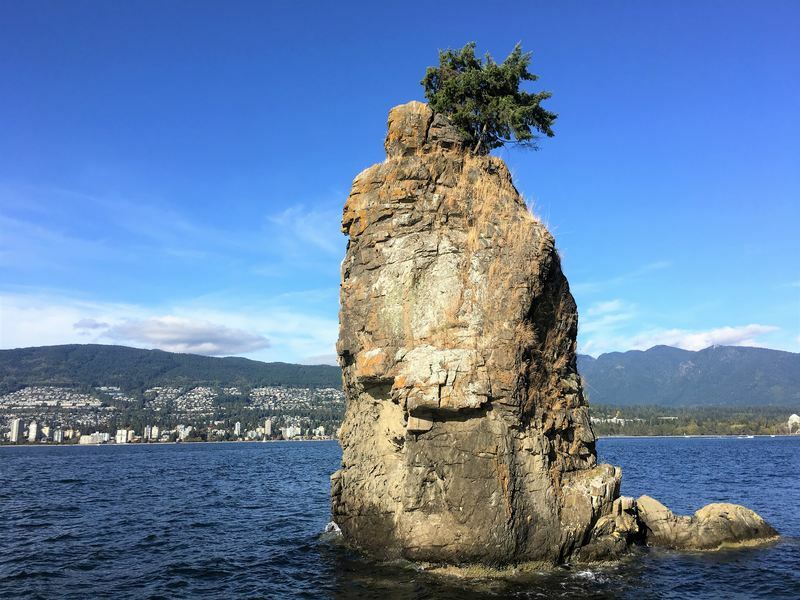 Did you know Vancouver has several beaches? 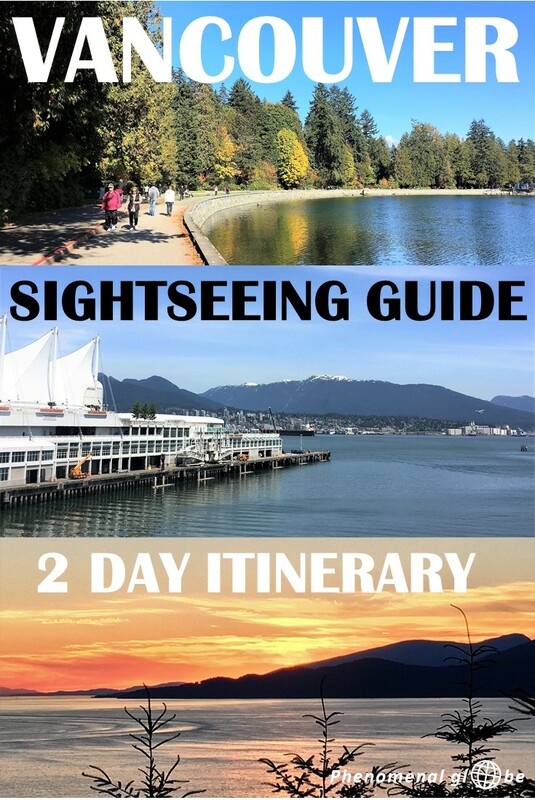 In downtown Vancouver you can visit Sunset Beach or English Bay Beach. 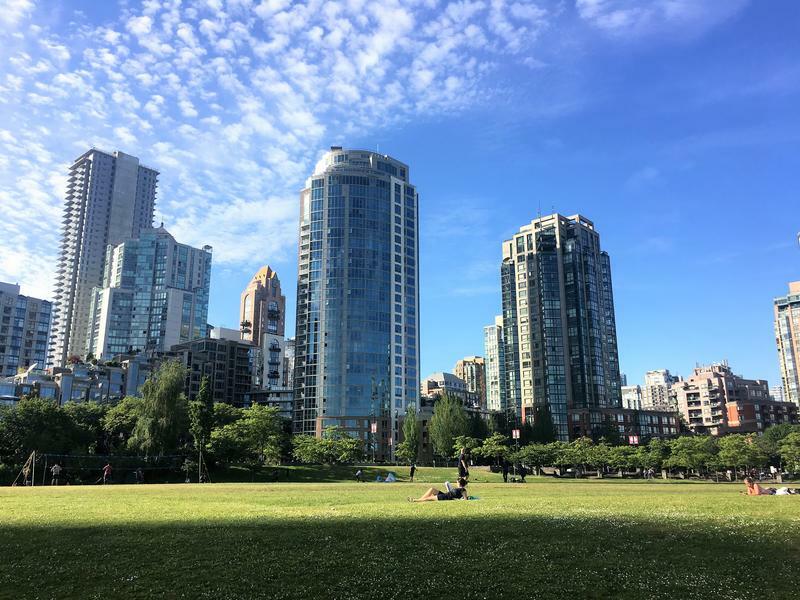 Just across the Burrard bridge you will find Kitsilano Beach Park, the perfect place to watch the sunset! Note: if you aren’t visiting in summer you might want to do this before dinner, otherwise you’ll miss the sunset;-). We actually stayed in Vancouver longer than 2 days, when we arrived in Canada we spent several days in the city to find the perfect van for our road trip. At the end of our trip we returned to Vancouver to sell our car, so in total we spend quite a bit of time in the city. Anyway, my point is that I can say from personal experience: visiting Vancouver can be done on any budget! 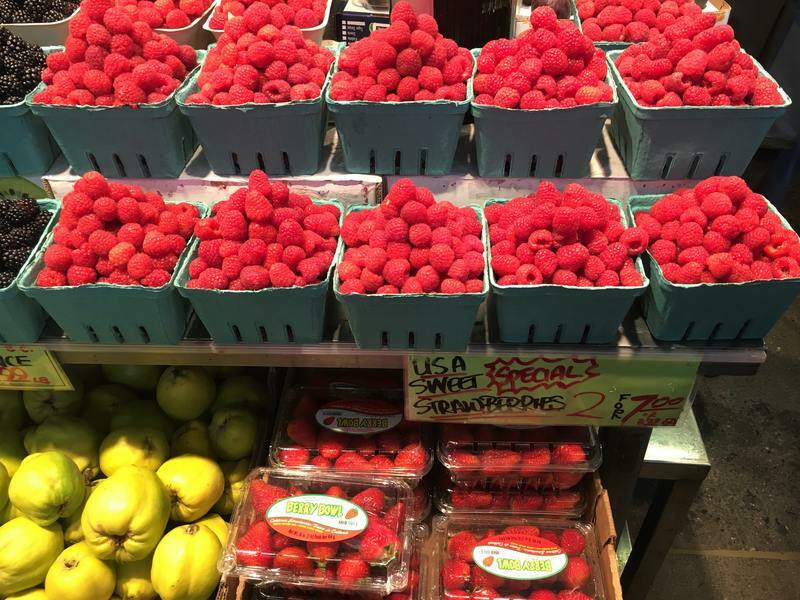 Also read: How much does it cost to travel Canada? 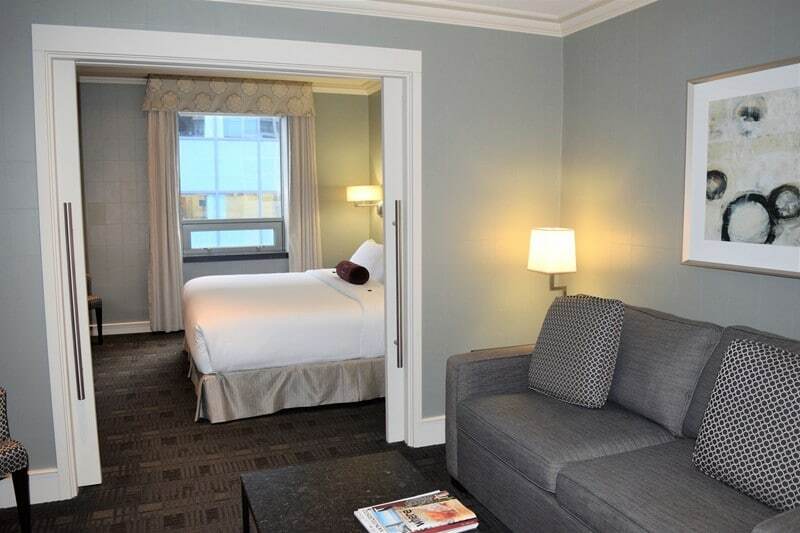 If you are looking to treat yourself to a nice hotel in Vancouver city center, the St. Regis hotel is your best choice! 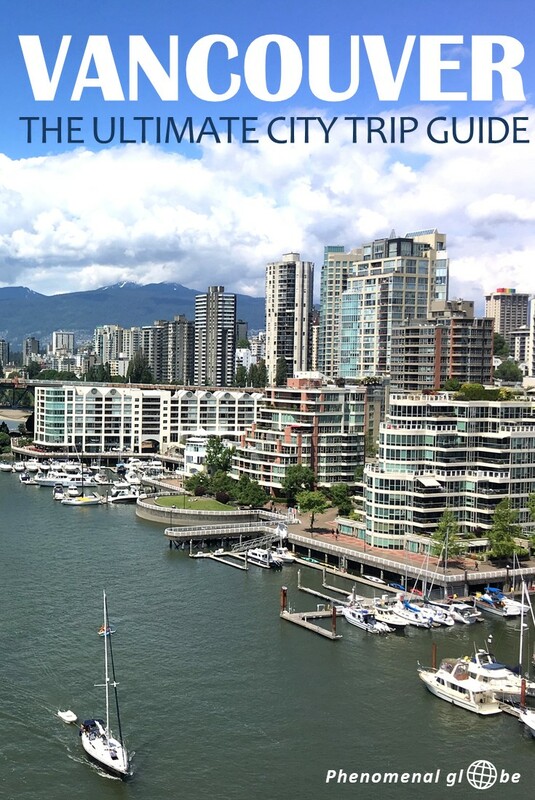 We stayed here for 2 nights and it was the perfect way to end our 5 month trip around Canada and the U.S.A.
St. Regis hotel is located in downtown Vancouver, so you can easily walk everywhere. The Skytrain station (Vancouver City Centre, see more info about transport below) is only a 400 meter walk and it takes about 30 minutes to get to the airport (or from the airport to the hotel). Our room at the St. Regis was beautiful, after living in a van for 5 months Frank and I almost got lost in our big suite! Our bathroom alone was bigger than our entire little red house on wheels. The bed was super comfy and WiFi very fast (each room has its own router). Breakfast was delicious (especially the omelet) and the staff is very helpful and friendly. 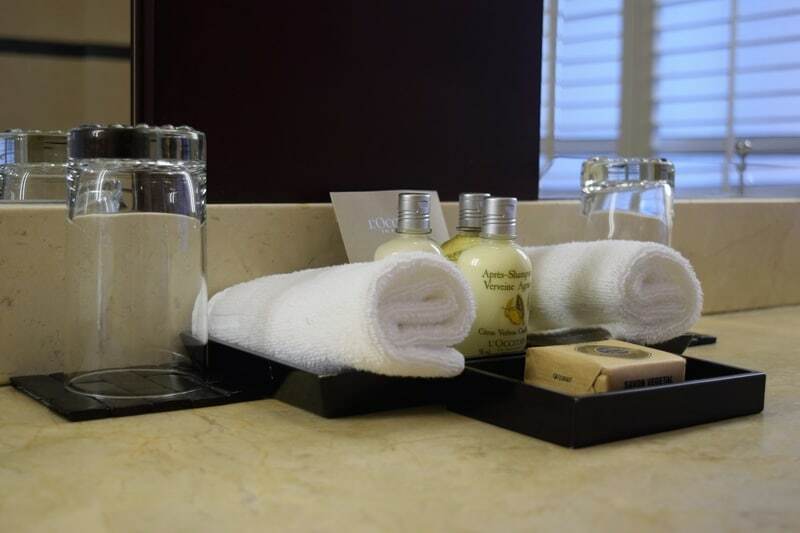 Check the St. Regis Vancouver website for current prices (room rates include breakfast and unlimited international calls). 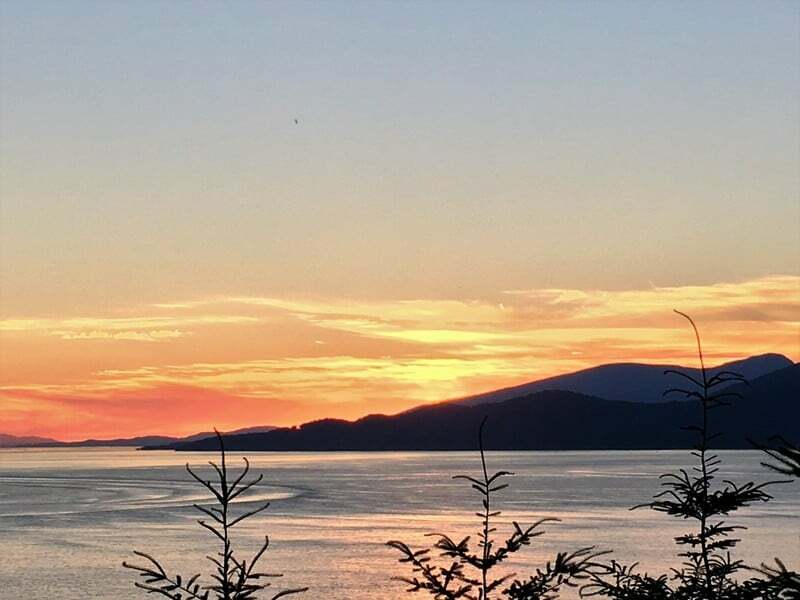 If you are on a budget and have a camper car or van to sleep in, you can stay in Vancouver for free! There are several overnight camping spots, you can find them via (free) iOverlander app. Not listed on the app is the IKEA parking lot in Richmond, but we did spent a night there. I’m not sure if it’s allowed but there weren’t any ‘no overnight parking’ signs so we decided to risk it (nobody bothered us or asked us to leave). 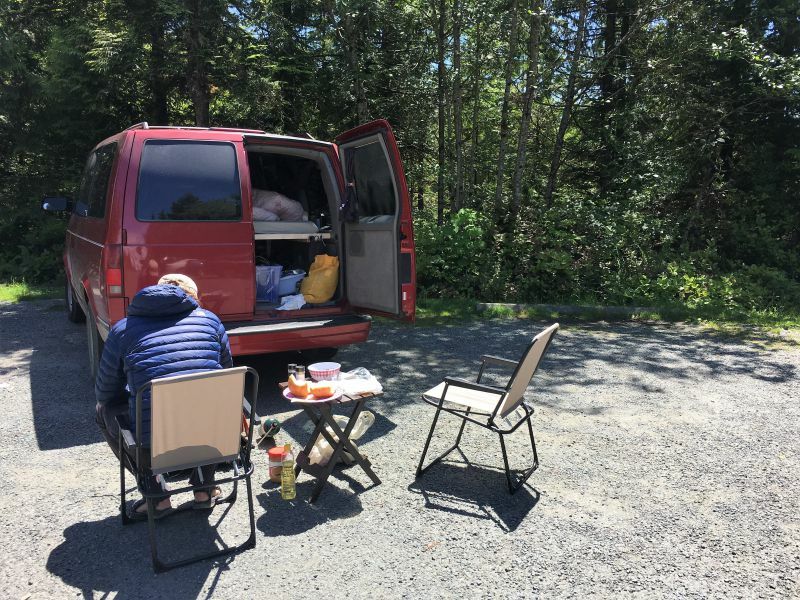 If you are traveling on a budget but don’t have a car, there are plenty of rooms on Airbnb and Homestay, I used both to book accommodation in Vancouver when we hadn’t bought our van yet. 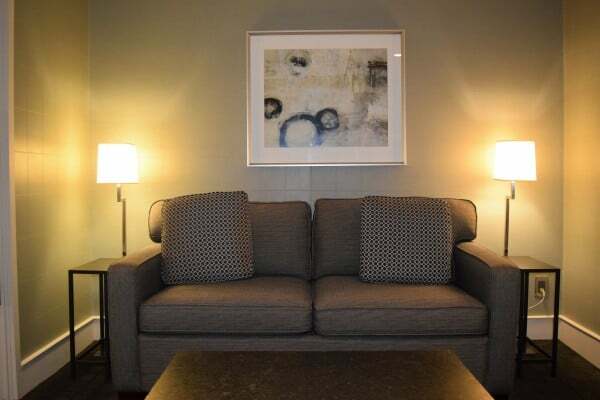 We paid 40CAD for our Airbnb room (unfortunately no longer listed because the host moved to a different place) and 65CAD for our Homestay room. I’ve already written about the Aquabus, but another important part of Vancouver’s public transport system is the Skytrain. There are 3 lines, the most important one is the Canada line which connects the city center and Vancouver International Airport (YVR). 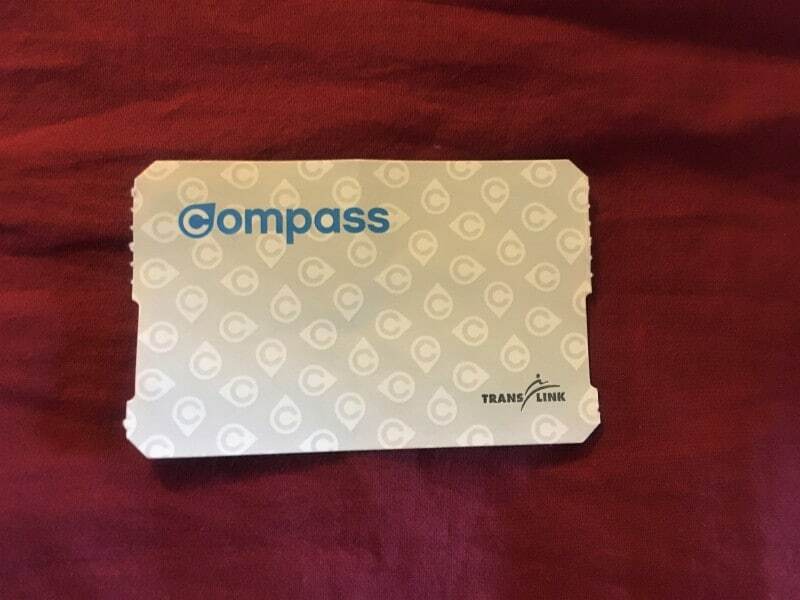 You can buy a DayPass or a single ticket for the Skytrain. A single ticket is valid for 90 minutes, you can transfer as many times as you want within that time. Prices can be found here. You can also use these cards on the bus, though for the itinerary described in this post you don’t need to take a bus. That’s everything about our trip to Vancouver! 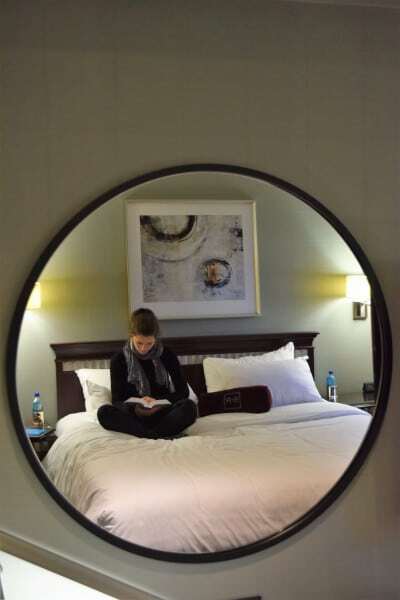 Do you want to read more about traveling in Canada? You can find my other posts here. Disclaimer: I was a guest of the St. Regis hotel in Vancouver. Nevertheless, all pictures and opinions are my own. Great, Lotte! 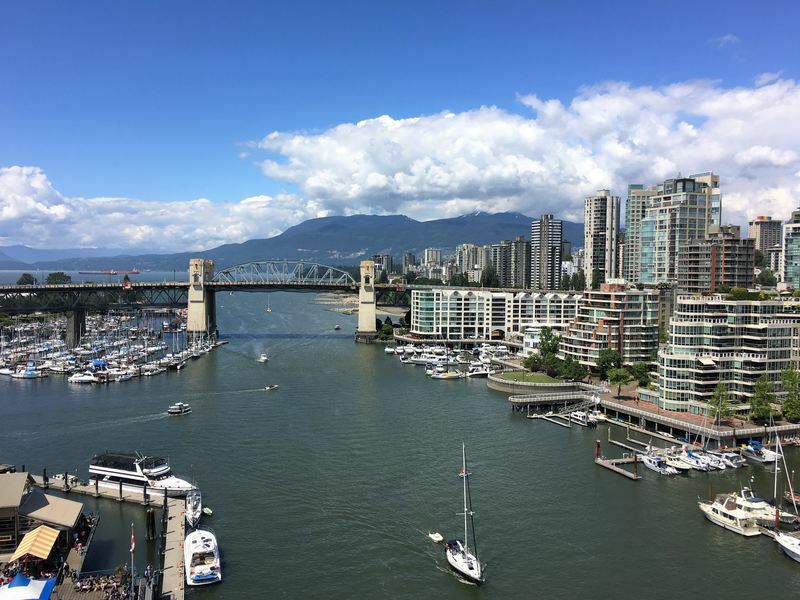 Vancouver looks great – I´ve heard loads about its great music scene and it looks like the food and culture aspects are good too. Airbnb is a great way to get a local flavour of a place – and often feels more authentic than a hotel. Thank you Mark! Unfortunately we didn’t have time to explore the music scene (perhaps next time) but we did have a lot of fun in Vancouver:-). And yes, I love Airbnb too. (Almost) all hosts are happy to share local advice about their city and the places they recommend often end up being your favorite! This is a fabulous guide Lotte with sensational images. I find it neat how Vancouver grew on you too. I found that to be the case with more than a few cities. As for Tim Horton’s I almost grabbed a cup there in NYC recently. Gotta try it. I am heading in NYC again tomorrow for a Seinfeld show and then a week long house sit so I will have my chance. Thanks for the rocking share. Thank you so much! I bought a Nikon D3300 (my first camera ever) and I’m so happy to hear you love the pictures:-). 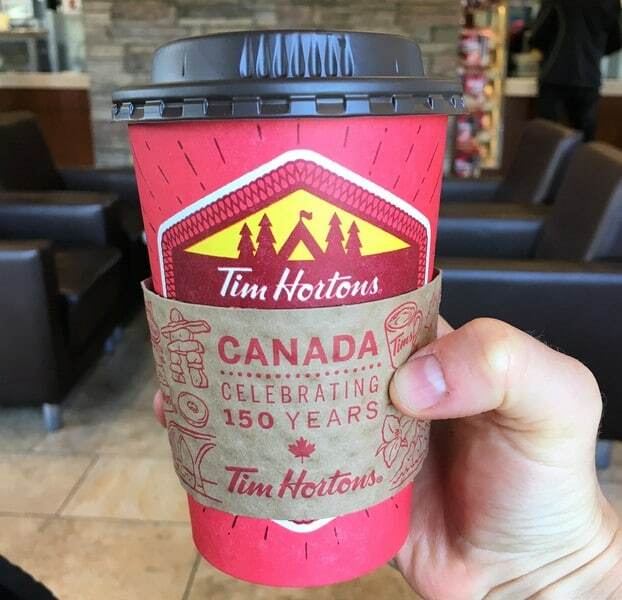 Hope you get to grab a cup of Tim’s in New York! Enjoy the housesit, I love this way of traveling. You get to experience what it’s like to live somewhere instead of just visiting. Also, have fun at the Seinfeld show! Mighty good. Nice to see info from people who have been there. Keep the good work going, 5-stars!